The Trump-Cyrus “Temple Coin” | Have Ye Not Read? You’ve probably seen news articles about the new coin being minted in Israel featuring president Trump’s image superimposed over the image of King Cyrus of Persia. And you’ve likely seen the enthusiastic, and I dare say raving comments from Christians about what a significant event the minting of this coin is. According to an article in the Daily Mail, the makers of the coin “liken Trump to the savior from the Bible.” This, of course, is not in reference to Jesus Christ, but instead, in reference to King Cyrus, who, some 2,500 years ago conquered the Babylonian empire and allowed a small contingent of Israelites who were largely of the tribe of Judah to return to Jerusalem from their exile in Babylon to rebuild the Holy Temple. 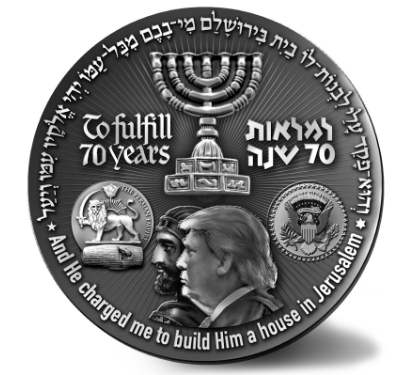 The coin was said to have been minted to honor president Trump for his recognition of Jerusalem as the capital of the Middle East nation of Israel. We’ll come back to that mistaken notion in just a moment. But first, let’s look at this “Trump-Cyrus” coin for what it actually is. Only 1,000 of the “coins” were actually minted by this organization, according to most news sources. They’re approximately two inches in diameter, and are made of pewter (i.e., cheap tin mixed with a few other inexpensive metals), with some of the “coins” being silver-plated and some being gold-plated, according to news reports. The “coins,” which cost only a few dollars apiece to mint, are being sold, largely to U.S. Christians, for $50 to $70 per coin. In short, the so-called Trump-Cyrus “Temple coin” (i.e., medallion) is simply the centerpiece of a fundraising gimmick. It was minted by a small, private Israeli company that “holds educational activities in the U.S.” regarding the building of the so-called “Third Temple” in Jerusalem, and which has apparently learned how easy it is to use cheap trinkets to shake down Biblically illiterate Christians for their hard-earned money. In reality, Cyrus simply released a very small group of Israelites under Ezra and Nehemiah to return to Jerusalem to rebuild the true temple of God. When he did so, he was acting in accord with the prompting of the Holy Spirit of God (Ezra 1:2), and in direct relation to the Holy Scriptures in which God told the children of Israel, through the prophet Jeremiah, that they’d be going into captivity for 70 years, and afterwards would be allowed to return to Jerusalem (Jeremiah 29:10; Daniel 9:2). King Cyrus the Persian did not free the Israelites from Babylon to move a governmental embassy to Jerusalem. So comparisons between Cyrus and Trump are essentially ludicrous. Yet I continue to hear these comparisons being made, even among supposedly learned Christians. Cyrus ruthlessly and with great vigor conquered the entire empire of Babylon, and afterwards released that small contingent of Israelites to return to Jerusalem. Instead, he’s re-affirmed and strengthened NATO…double-mindedly proclaimed himself “both a nationalist and a globalist” while leaving the bulk of the nation’s globalist treaties in place…eliminated all “America first” members from his cabinet and replaced them with globalist antichrist Jews…filled “the swamp” with even more vile swamp critters than ever…and has not lifted a finger to rebuild America’s infrastructure. So again, Biblical comparisons between Trump and Cyrus are based largely on gross misapplications of the Scriptures, to say the least. If anything, Trump is the anti-Cyrus (i.e., the instead-of-Cyrus) of these end days, not a type of the Biblical Cyrus. Again, in Old Testament times, after 70 years of Babylonian captivity, Cyrus conquered Babylon and was charged by God to release a small contingent of God’s People true Israel to return to Jerusalem to rebuild the true temple. What’s more, most of the misapplications of Scripture being bandied about online — such as the Trump/Cyrus comparison — are being fed to Biblically illiterate Christians by the Christ-hating rabbis of false Israel, who want Trump to throw the weight of his prestigious office behind the building of a so-called “Third Temple” in Jerusalem, now that he’s moved the American embassy there. In other words, they want Trump to do the work of the antichrist by building a temple designed to replace Christianity with a false religion and a false messiah. That Cyrus most certainly did not do. Cyrus did the work of God Almighty by conquering Babylon and freeing that small contingent of Israelites to return to Jerusalem to rebuild God’s holy temple — a job which, as we’ll see momentarily, Christians can continue today simply by teaching the Gospel message, as we’re ordered to do by Jesus Christ Himself (Mark 16:15). That’s the spirit of the antichrist they’re spreading, beloved. Not the spirit of Jesus Christ. The so-called Third Temple in Jerusalem will indeed be called “the temple of God.” But in reality, it’s the habitation of the antichrist himself, i.e., Satan in his role as the false messiah, seeking to replace Jesus Christ and His many-membered body with a lie. And Christians who fall for it will, quite unwittingly, become the spiritual “bricks” in that false temple. “’President Trump is starting a prophetic process by moving the American Embassy to Jerusalem,’ Mikdash representative Rabbi Mordechai Persoff told KOBI. Uh, yeah. “A prophetic process.” Please remind me again exactly where that’s written in the Bible. Of course, you can’t, because it’s not. You’ll never find God living in that “house.” A governmental embassy in Jerusalem is not the Temple of God, by any stretch of the imagination — especially one that’s in cahoots with those who hate, loathe and despise the Son of God, Jesus Christ, and teach through their own so-called “Holy books” that his mother, Mary, was a whore and that He’s boiling in hot excrement in hell, eternally. It’s Kenite chicanery, pure and simple, to conflate the moving of the U.S. embassy to Jerusalem with the work of Cyrus in conquering the entire empire of Babylon and freeing a small contingent of God’s people to return to Jerusalem and rebuild the temple of God. And Christians are not only falling for this false doctrine, but carrying the water of the synagogue Jews of Revelation 2:9 and 3:9 for them by embracing, promoting and cheering it on. So the word “Mikdash” simply means the holy place, which of course is in reference to the Temple of God, the dwelling place of God. In other words, the Mikdash Education Center seeks to educate people worldwide about the supposed necessity of building a “Third Temple” or “holy place” in Jerusalem, which they claim is necessary for the arrival of the “Messiah.” Their website explains this clearly and explicitly. Of course, the true Messiah of God, Jesus Christ, already has a temple. He needs not have one built for Him in Jerusalem out of brick-and-mortar. In other words, the true dwelling place of God is not and never again will be a physical building located in the physical city of Jerusalem, but instead, is the worldwide many-membered Body of Christ. He indwells within faithful Christians through the Holy Spirit. The true “temple of God,” therefore, is a living temple, not the brick-and-mortar building the members of the Judaic religion are looking forward to constructing in Jerusalem for their false messiah, who is the devil himself. That “chief corner stone” of the true temple of God was laid in Zion some 2,000 years ago, beloved, when Christ gave His life on that cross on the hill known as Golgotha. It’s the spiritual cornerstone (named Jesus Christ) to a spiritual temple known as the Body of Christ. Get it? The “wisdom of this world” tells us we need to support the building of a “Third Temple” in Jerusalem. But falling for that “wisdom” is a form of spiritual defilement. In this flesh earth age, I believe the only “Third Temple” in Jerusalem is going to be the many-membered body of the antichrist. And all too many Christians have joined it already, in their hearts, without even realizing it. God’s word tells us we’re to support the building of the true temple of God — which is the family household of God under the rule of Jesus Christ. Period. Leave all of the hoopla over the building of physical temples in Jerusalem to the false Jews. It’s a defilement of your very soul to support or cheer for such a thing. So be very careful of that which you cheer about. I see lots of cheering among Christians for the building of a physical so-called “Third Temple” in the city of Jerusalem. Again, Christians who support the false Jews of Revelation 2:9 and 3:9 are unwittingly going to be the very “bricks” in that “Third Temple,” beloved. Are you really cheering for that? Oddly, I don’t see much cheering among Christians any longer for the spread of the Gospel message. Not much at all. Isn’t that odd to you? It’s as if Christians today have completely forgotten about spreading the Gospel to those who don’t have it, and have instead turned toward the moronic religious traditions of the false Jews. It’s certainly a sad commentary on what passes for the Christian church today. 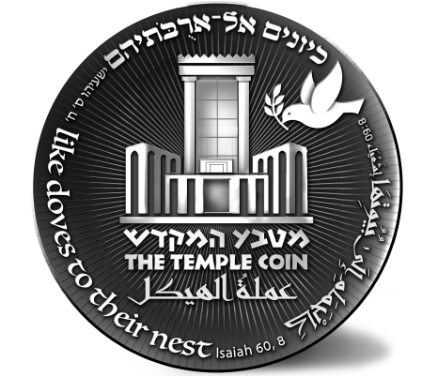 They so badly want these end days to be “over with” that they cheer a stupid, cheap tin “temple coin,” and support in their hearts (and oft-times with their wallets) the building a “Third Temple” in Jerusalem. But they no longer want to accomplish the true work that needs to be finished in order to get this flesh age over with, which is to say, the uncompromising setting forth of the Gospel message to the rest of the world. This flesh earth age cannot end until the Gospel message has been preached in every corner. That’s why God will ultimately have to intervene and do it Himself when He speaks through His elect after they’re betrayed by their own kind and delivered up to the Sanhedrin councils and religious synagogues of Satan, as explained in Mark 13. And Christians wonder why the Scriptures says Jesus will summarily reject some of them when He arrives (Matthew 7:23). Well, they left all of the work up to Him, while they buddy-buddied around with the false Jews and cheered and supported their deceptive work. Eph 2:18 For through him [i.e., Jesus Christ] we both have access by one Spirit unto the Father. God dwells within His faithful elect, beloved. He does not, and never again will, dwell in a physical building in earthly Jerusalem, which is the city of the desolate (Luke 13:35) as well as the city of the coming desolation (Mark 13:14). He dwells instead in a worldwide body of people who have received the Gospel message with joy and who faithfully carry it forth on His behalf (Mark 16:15). That’s His dwelling place forevermore. It’s sad Christians don’t understand that simple, Bible truth. Faithful Christians, in spreading the Gospel message of Christ, are helping build the true (and only) temple of God. That, beloved, is the true “Third Temple” of God, i.e., the faithful many-membered body of Christ. It’s 2,000 years old, and it’s still being built. You’re part and parcel of that temple, if you’re faithfully sticking to God’s Word and not being carried away with “every wind of doctrine by the sleight of men, and cunning craftiness, whereby they lay in wait to deceive” (Ephesians 4:14). In short, when Christians get caught up in the euphoria of supporting the building of a so-called “Third Temple” in Jerusalem, so that “Jesus can come,” they’re in reality (albeit unwittingly) rejecting the Biblical truism that faithful Christians are, and always will be, the true temple of God. They’re ignoring the building of the eternal spiritual temple — the many-membered body of Christ — and are ignorantly focused on the building of an earthly physical temple which is of the antichrist himself, and which has no redemptive power whatsoever, but can only destroy one’s soul. “Touch not the unclean thing,” beloved (II Corinthians 6:17). Don’t cheer for the work of the antichrist and his little antichrists in Jerusalem. Jerusalem simply means the “habitation of peace.” And it’s only those who have the Holy Spirit of the Prince of Peace dwelling and operating within them who make up that habitation of peace and its true temple. The children of Satan love to deceive Christians into thinking that in supporting their activities in regards to the physical city of Jerusalem, they’re participating in fulfillment of Bible prophesy. But all they’re actually doing is spiritually defiling themselves, looking to “hurry up” the end days without having to do the work of the end days, which is the spread of the Gospel of Christ to the rest of the world. So sit back and watch what the antichrist Jews are doing, yes. Carefully note everything they do in relation to Bible prophesy, yes. But participate in it…cheer it on…have your spirits lifted up for seeing it…no. For what you’re cheering for is an abomination to the Lord. He even calls it “the abomination which maketh desolate” (Daniel 12:11; Mark 13:14). Why Do the False Jews Want Christian Support? I sincerely doubt there will ever be a physical brick-and-mortar “Third Temple” in Jerusalem. There might be. But I doubt it. The false Jews continue to push for one. And they continue to push for Christian support of one. Isn’t that amazing, considering their hatred of both Christ and Christianity? Why would they need and want the backing and support of Christians? Why can’t they just build their so-called “Third temple” without our support? They’ve built entire metropolises in that country. It’s because the building of that “Third Temple” in Jerusalem is already taking place. But it, too, is a spiritual building with global reach. You see, it’s the many-membered body of the antichrist. And sadly, it’s composed largely of fallen Christians, which is to say, Christians who have unwittingly thrown their support behind the false Jews and their various antichrist projects, thinking they’re helping fulfill Bible prophesy and bring this flesh age to a faster close. And that’s nothing to cheer on, beloved. You should be working to build up Christians in the Word of God, not unwittingly cheering their fall into the arms of the antichrist through all of this “Third Temple” nonsense. If you want to participate in the building of the true “Third Temple,” and work to bring about the end of this flesh earth age, then beloved…teach the Gospel. That’s the only way. Have you forgotten? The true temple of God has been in the process of being built ever since Jesus Christ died on that cross at Calvary. And it’s still being built today — through the preaching and teaching of the Gospel of Jesus Christ which draws more and more of God’s children into His many-membered body, which is His Temple. The true “Third temple” is called Christianity. Again, it’s not some brick-and-mortar building in Jerusalem. It’s a global living body of supporters of Jesus Christ. And there will never be another. It’s eternal. So instead of cheering on the work of the antichrist, Christians should be embracing and cheering on the work of Jesus Christ. Unfortunately, all too many Christians in the final days of this flesh age have been tricked into abandoning that Gospel work, thinking themselves to be “wise” in taking part in, or supporting in their hearts, the work of the false Jews, which is an abomination and a desolation to one’s very soul. Instead of buying stupid pewter coins to help fund the works of the antichrist, Christians should be doing what the Scripture says, and “buy of Me gold tried in the fire…that the shame of thy nakedness do not appear” (Revelation 3:18). “Gold tried in the fire” means all of the impure elements (i.e., the religious, political and social traditions of man) have been removed, and only God’s eternal truth remains. As Christians, we’re to work to remove all of the impure traditions that are being foisted upon us in place of the truth of God’s Word. The plain, unadulterated truth, beloved, is far more valuable than gold (and far more so that cheap, silver or gold-plated “temple” coins). Leave the building of the so-called “Third Temple” to the Christ-haters in Jerusalem, beloved. And work to keep as many Christians as possible from becoming spiritual “bricks” in that temple, by waking them up to the truth. In short, be very careful of what you cheer for. And as an aside, be careful of who you label a “King Cyrus.” You might just be showing your ignorance of God’s Word. To date, there is no Biblical correlation between Cyrus and Trump whatsoever. It’s easy to get caught up in the euphoria of the masses and get pulled off-target. Again, don’t allow yourself to get carried away with “every wind of doctrine by the sleight of men, and cunning craftiness, whereby they lay in wait to deceive” (Ephesians 4:14). As it’s written, we’re supposed to stay on a very narrow path, and “Turn not to the right hand nor to the left: remove thy foot from evil” (Proverbs 4:27). And as it’s further written, “Wherefore let him that thinketh he standeth take heed lest he fall” (I Corinthians 10:12).